The author, Tahilia Newland, gave me a copy of this novel in exchange for my review. Throughout the Diamond Peak series, Newland has been preparing Ariel for her ultimate goal. Ariel’s compatriots have absolute faith in her abilities but Ariel, as much as she’s grown, is very realistically not yet ready to trust herself. Ariel is working her way figuratively and spiritually to that final uphill destination. Ariel and Nick’s relationship has deepened and sacrifices might have to be made. Newland leaves a credible uncertainty in her story that brings readers to the edge of their seats. This is a tough story as is befitting a novel about the life and death of humanity. Newland doesn’t give her young adult audience a break and while young readers may not get the message and depth of symbolism immediately the story will stay with them. I truly enjoy young adult authors who don’t consider their audience lacking in intelligence. She treats her audience with respect and gives them a wonderful tale that challenges their ideas and perceptions. I appreciate that Newland has developed a strong female character in Ariel with such a wonderful support system. She’s not sure if she can beat the Master Demon, but Ariel has a strong cheering squad behind her that believes 100% in her ability to achieve the goal. They allow her to have fun and be a teen while acknowledging that something truly horrible could happen very soon her, but Ariel has it handled. They allow Ariel to live with the pressure she puts on herself and young girls will aspire to her example. Newland has written the novels in the Diamond Peak series so that they can be read as an individual work much like any novel in the Lord of the Rings series can be enjoyed independently. The quality of the writing style rivals the works of masters like Tolkien and if there were any technical errors; I missed them. The clean flow allows for a fluid immersion experience in the story line. Though the stories can be read alone, any reader using Eternal Destiny (Diamond Peak #4) as a singular experience will miss the mastery with which Newland develops the overall plot and characters. 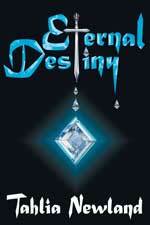 Eternal Destiny (Diamond Peak #4) is a fabulous story and fitting end to the Diamond Peak series. Intended for young readers, the themes and complex writing style of the Diamond Peak series will hold the fascination of an adult audience. For further reading check out the review Lethal Inheritance: Diamond Peak 1 by Tahilia Newland. For more information about Australian author Tahlia Newland and her work, visit her website. You can connect with her on Goodreads, Facebook and Twitter @TahliaNewland.